The Steam Lunar New Year Sale is now live, and there's a chance to earn some additional discounts this year thanks to a new token system. 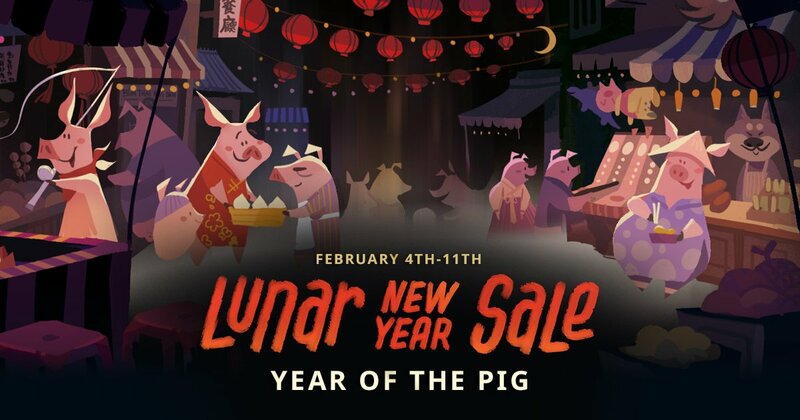 The Lunar New Year Steam Sale runs from February 4 to February 11. Another Lunar New Year, another Steam sale. This time, Steam is rolling out a token system where buying games will reward customers with items that can be redeemed for prizes and additional discounts. Players can redeem tokens for new badge icons, profile backgrounds, and emoticons. You can head over to Steam now to immediately collect a one-time automatic $5 discount coupon on qualifying purchases over $30. For 15,000 tokens, players can redeem an additional $5 discount coupon towards their next Steam purchase. There doesn't appear to be a limit on how many times players can exchange tokens for discount coupons, but I imagine there's a point where it's no longer economical to keep buying games for $5 discounts. Valve also announced that the winners of the 2018 Steam Awards will be revealed on February 8 at 10am PT via a broadcast on Steam TV. The winners were chosen by players who voted for games during the Steam Winter Sale. Currently, there are some steep discounts on hits like Rainbow Six Siege, Grand Theft Auto 5, Sid Meier's Civilization 6, and Far Cry 5. All of which are on sale for 50 to 75 percent off. Head over to Steam to check out the full list of sales for this year's Lunar New Years. Tagged with Action,	FPS,	News,	PC,	Shooters,	Steam,	Steam Lunar New Year Sale,	Valve Software.